La Révolution ! Et puis après ? D’abord l’insécurité et le déclin économique. Abdallah, Un jeune Tunisien a des doutes sur son futur après la révolution de 2011. Doit-il aller en Europe ? Son père répond que non. Mais, il rencontre une touriste hollandaise. DIE WELT (« Le Monde », en allemand) est le 1er long métrage du réalisateur hollandais-tunisien Alex Pitstra. Thèmes : Drame, Politiques, Problèmes sociaux, Immigration, Docufiction. Revolution! And then what? At first, usually insecurity and economic decay. A young Tunisian has doubts about his future after the 2011 revolution. Should he go to Europe? His father says no. But he meets a Dutch female tourist. Feature debut by Dutch-Tunisian filmmaker. A young DVD seller in Tunesia named Abdallah tries to make ends meet in a society caught in a vacuum between democracy and dictatorship. It is 2011, shortly after the Jasmine Revolution and jobs are all but non-existent. Abdallah’s friends dream of Europe and its wealth, telling success stories about acquaintances in the rich West. But Addallah’s father, who was once a’guest worker’ in the Netherlands, tells a different story.’That world’, as he calls Europe, has had its day. Nevertheless, Abdallah’s frustration with life in Tunisia grows and after meeting a Dutch tourist, he cautiously starts to dream of a future in Europe. This contemporary fiction intertwines the personal anecdotes and perspective of the half-Dutch Tunisian filmmaker with stories from members of his family. Pitstra’s hybrid, documentary-like style provides colourful, realistic images of everyday life in the region. « To me Die Welt is an exploration of both myself and of the person I could have been if my father had made different choices in life. Abdallah’s character is partly based on me. He views his country from a distant perspective, just like I see the country from a Western point of view. I made notes of my observations during my travels, and integrated them in the film. 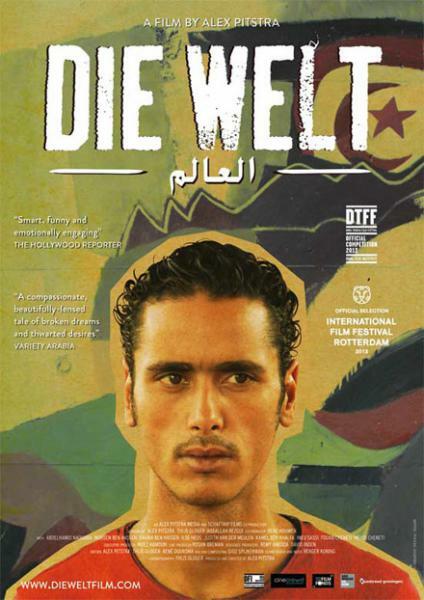 I think that in Die Welt we see Tunisia through Western eyes. We see a country that is a lot more modern than what we see on the news on TV. On the other hand the film presents Tunisian society in a way that Tunisians are not yet familiar with. I myself am a child of Fort Europe. I discover my Tunisian identity in Die Welt. Trailer Die Welt | IFFR 2013 from Alex Pitstra on Vimeo. Subtitles available: Dutch, English, French and Arabic. Most of the scenes in Die Welt were shot with a Sony F3-camera that was connected to a KiPro mini-recorder that records to ProRes422 HQ 1080p HD. A number of other scenes were shot with a Canon 5DmkII. Rated 18: Viewers under 18 must be accompanied by an adult.